Paul Graham at Le Bal, Paris. 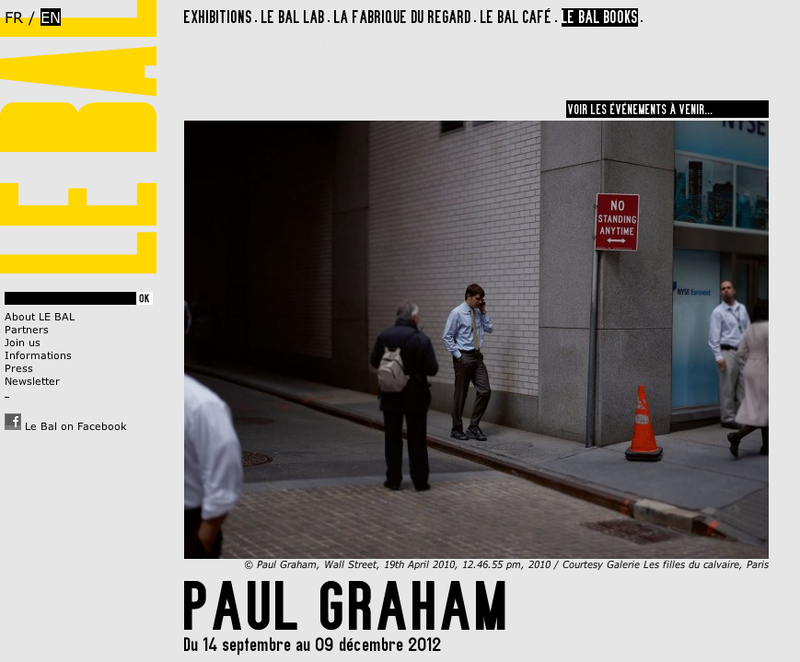 Paul Graham at Le Bal in Paris from the 14th Sept 2012 to 9th Dec 2012. I had the chance to meet Paul Graham at the Whitechapel Gallery in London and he is really easy to talk with about his work. I like the idea of this work from his new book the present, however I am not quite so sure about the printing of the book. Paul moved to digital awhile ago and I congratulate him on that move as I believe that it is the future of image making for photographers and to many photographers (those who think of themselves as artist photographers at any rate) chose to use film because of some idea that this is what will make them successful in the art market. I personally think it is the image and always the image that will get you noticed. Anyway I digress, If you are in Paris for this time I would suggest you get to see Paul Grahams work in person as I think it is better reproduced on the way than in the book. The Present. amazon link or at his publishers Mack: The Present by Paul Graham. This exhibition is held in partnership with Galerie Les Filles du Calvaire in Paris and Pace/MacGill Gallery in New York. A few months after retrospectives of his work at London’s Whitechapel Gallery and the Folkwang Museum in Essen, Germany, LE BAL presents two series by Paul Graham: Beyond Caring (1984-85) from his early career, depicting unemployment offices in Thatcher’s Britain, and The Present (2011), shown for the first time in France and the final part of an American trilogy which also includes American Night(1998-2002) and A Shimmer of Possibility (2004-2006). In the mid-1980s, Beyond Caring introduced a new kind of social commentary to the great British tradition of sociological surveys, regenerated by the unconventional and, given the documentary nature of the work, controversial use of colour. Refused permission to take photographs in unemployment offices which were bursting at the seams with 10 million people out of work, Graham put his camera on the floor or on the chair beside him, and took the photos without using the viewfinder. The random compositions with their arbitrarily framed, resigned bodies, further heighten the sense of alienation. The Present pays tribute to the legacy of the American masters of street photography – Harry Callahan, Lee Friedlander, Garry Winogrand – and the hustle and bustle of New York City whose streets are a jumble of people, neon lights, signs and gestures. Graham captures two (or three) images from this uninterrupted flow, taken just seconds apart, and presents them as diptychs (or triptychs). Set side by side, the images reveal unexpected, fortuitous affinities between two points in time. The decisive moment unfolds. Looking back and forth between the images, we are prompted to consider how they are connected, and this heightens our awareness of the ephemeral alchemy of reality. Like John Baldessari before him, Paul Graham captures that unlikely instant when three balls thrown into the air are suddenly perfectly aligned. The extraordinary within the ordinary. Triviality as perfection. The Present is both an incisive political analysis of contemporary American society and an exploration of photography as language, although this second point is more elliptical than demonstrative. The dominant theme is our awareness of others and of things, and the highly focused attention to reality this requires.